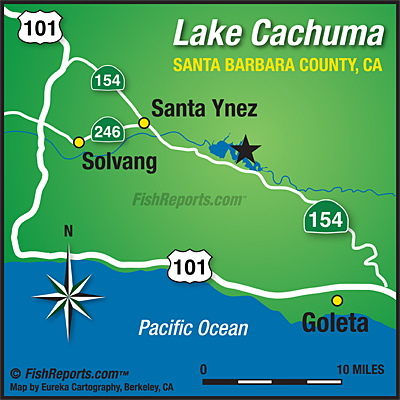 Welcome to Lake Cachuma! The water is getting colder by the day as we enter the winter season. The catfish bite has been very strong lately! Lots of mid-size cat fish coming up off the bottom on any stinky bait. The bass are biting hard. They are caught pretty much anywhere along the shoreline. The rainbow trout are coming closer to the top of the water column. We stock the lae with trophy size rainbow trout during the winter. Last year we planted 12,000 lbs and we will be adding to the population. Blue gill & red ear being caught 2-4 feet under the surface. We suggest using a floater. Crappie are biting 5 to 10 feet under the surface. They are mostly caught near structure (reeds or shade). We have excellent bow fishing at this lake for large carp. These fish are an invasive species feel free to remove them. We are at about 35% capacity, with about 85ft, of water at Bradbury Dam. Come visit our bait & tackle shop for anything you may need. Check out 805webcam for weather conditions and scenic views.